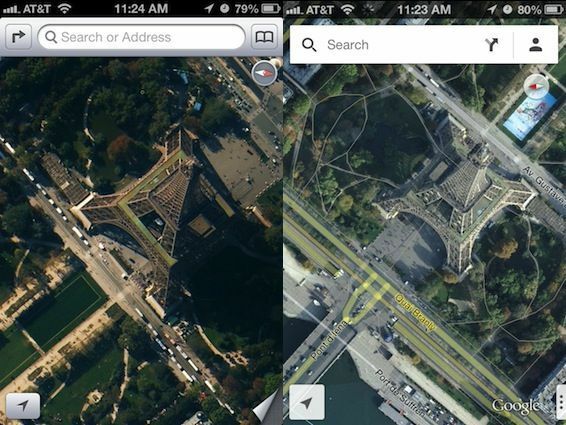 For iPhone users, Google Maps is back. The revamped app, launched last week, is being downloaded in the tens of millions. As a result, iOS6 activations are on the rise. And Apple finally has the breathing room it needs to overhaul its much maligned Maps app, the default on the platform. But just how much of a hill does Apple still have to climb in order to compete? Quite a steep one. It is three times more likely to lead you on a wild goose chase than its rival, according to a study provided exclusively to Us. 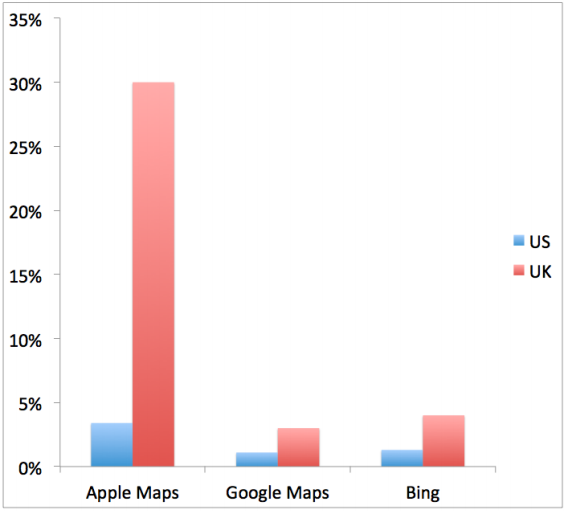 To test how Maps stacks up against Google’s (and Bing’s) offerings, the online workforce company CrowdFlower picked a random 1,000 business listings in the U.S., and another 100 in the U.K. For each listing, the company was looking for two things: whether you could find it on each of the three mapping services, and if so, whether the results were accurate. 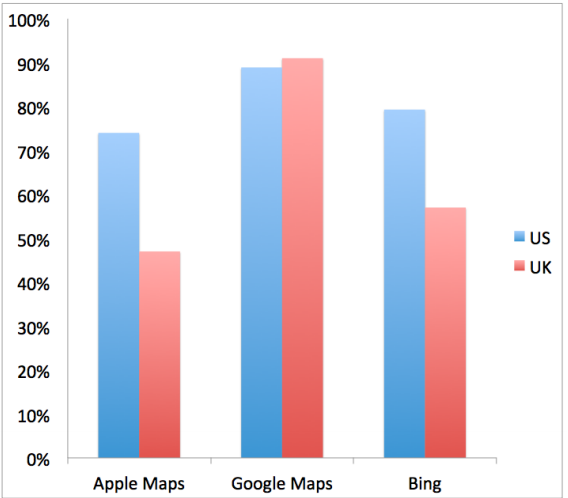 Apple’s performance was the worst of the three mapping services, with only 75% of listings found in the U.S. experiment, and a surprising 50% missing in the U.K. But things get worse for the Cupertino company when you look at just listings found. What percentage were shown in the wrong place? Fully one third of U.K. listings are inaccurately placed, making Apple Maps pretty much unusable in that country. But even in the U.S., where the error rates are much lower, Apple Maps gets the location wrong 3.4% of the time — three times Google’s error rate of 1.1% and Bing’s error rate of 1.3%.